Raising chickens can be rewarding in a number of ways, whether you enjoy the delicious eggs they produce, or you simply enjoy having them around as pets. No matter why you own chickens, it is important to make sure that they are well looked after. This, of course, extends to the food you give your chickens. There are certain essentials that you must feed your chickens to maintain their health, but sometimes it is nice to give your chickens a little extra treat to make them happy. For those of us that like to go beyond what is essential for our chickens providing them with extra treats to eat can be just the thing to entertain them. However, what we feed our chickens can have an impact on their health, and this can sometimes be negative, so it is important to make sure to make sure that when you treat your chickens, it still promotes the health of the chicken. 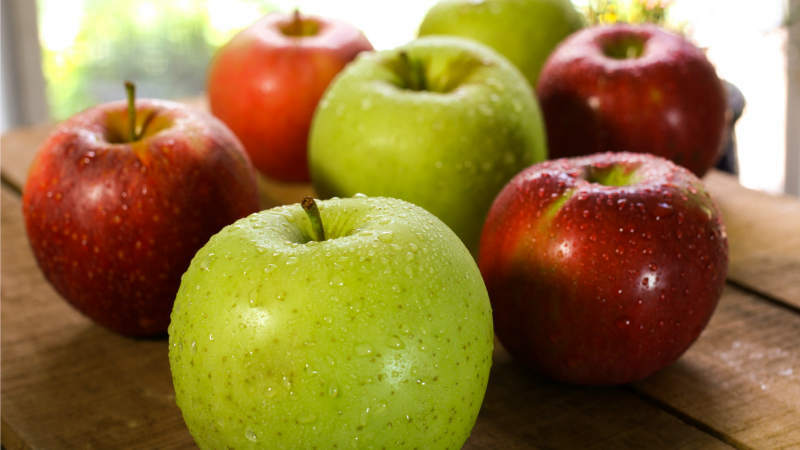 That is why in this article we will be looking at apples and seeing the reasons why this fruit may or may not be a suitable choice to feed your chicken. Are apples Okay for chickens? There are a number of reasons that you might want to consider apples as the primary source of treats for your chickens. The first of these is the sheer abundance of the fruit. If I asked you to think of any fruit, the chances are that apple would be what most people think of. For most people apples are probably one of, if not the, cheapest fruit you can feed your chickens. In fact, some of you will probably own an apple tree of your own meaning you can give your chickens a fruity treat at no cost at all. The other main reason to feed your chickens apples is the simple fact that they really enjoy them. While most chickens do have personal tastes and may turn their beaks up at some other fruits, I have still yet to meet a chicken who has not immediately enjoyed apples. Perhaps it is the flavor of the apple or the crunchy texture, but for whatever reason chickens love apples. While the reasons to feed your chickens apples are clear, there can also be plenty of drawbacks to the fruit. The main drawback being the time you will have to spend preparing apples to feed your chickens. Unlike some other fruit, you cannot just give your chicken an apple to eat and hope that they will be ok.
First of all, this would be far too much to feed your chickens, depending on the size an apple would be enough to feed a number of chickens over a longer period. Unfortunately, much like some humans chickens have problems sharing and controlling how much they eat. Overeating apple at once will inhibit your chicken's ability to lay high-quality eggs and can even lead to serious health problems if this becomes persistent. To avoid this, you should always cut your apples up into snack-sized manageable meals to be fed throughout the day. Another reason you need to be extra careful when feeding your chickens is that for chickens apple seeds can be very poisonous. Apple Seeds contain trace amounts of cyanide which may only leave a bitter taste in our mouths can be fatal for your chickens, for this reason, it is imperative that you never feed your chickens apples that still have apple seeds present. Unfortunately, the deseeding process can be a bit of a hassle, but it is a necessary one if you want to keep your chickens alive. Before you rush out to buy as many apples as you can there are some tips and tricks that might enhance your chickens experience with eating apples. First of all, as with any other fruit that you want to feed your chicken with, dried is best. The lack of moisture makes the fruit easier to digest and extra healthy for your chickens, so if you can find any dried apples, I would recommend these. Secondly, if you do want to feed your chickens apples from a personal apple tree, it is important to make sure none of these apples are moldy. Just like us, chickens will get sick if they eat moldy or out of date food so make sure not to feed your chickens anything you wouldn't eat yourself. Finally, if you can be aware of what variety of apple you are feeding your chickens, for their health it is better to feed your chickens something with less sugar and acidity, so steer well clear of Bramleys. Personally, I like to feed my birds' Cox, but if you can’t get hold of these, a Gala is also acceptable. While the time-consuming aspects of feeding your chickens apples may be too much for some, this is outweighed by the ease with which you can get hold of apples and the happiness it will bring your chickens. Foods that you should and shouldn't feed you chickens: What can chicken eat? What can’t chicken eat?